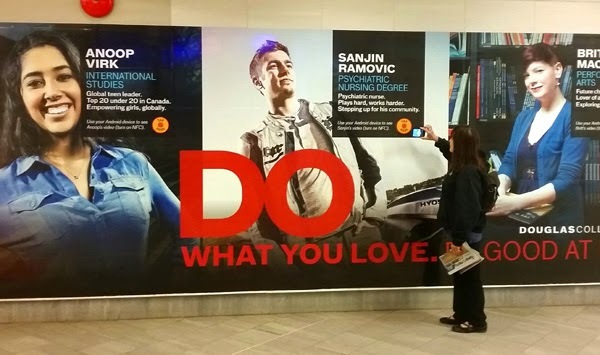 Next time you pass through Vancouver City Centre Station, keep your mobile device handy. You might want to check out an interactive Douglas College wall mural featuring a student and two grads. The college has incorporated Near Field Communications (NFC) technology into the mural. So if you have a NFC-enabled device, hold it close to the digital hotspots on the mural. You'll instantly connect the device to online video profiles about the students that will automatically pop open on screen. The emerging technology works by allowing mobile devices to communicate via radio frequency with small electronic tags embedded in the mural. The videos feature Performing Arts grad Britt MacDuff, Psychiatric Nursing grad Sanjin Ramovic and International Studies student Anoop Virk.